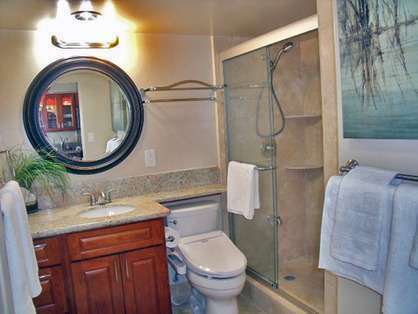 WaikikiBeachRentals.com - Remodeled Condo - Privacy Wall Too ! Remodeled Condo - Privacy Wall Too ! 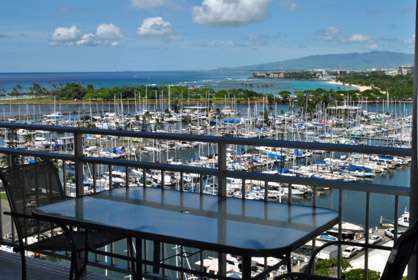 A great remodeled unit in the Ilikai with awesome ocean, marina and sunset views. This beautiful, completely newly renovated condo is outfitted with the highest quality materials like granite counter tops, stainless steel appliances, new flat screen TV and DVD, travertine shower, full gourmet kitchen with dishwasher and gorgeous modern style furniture. 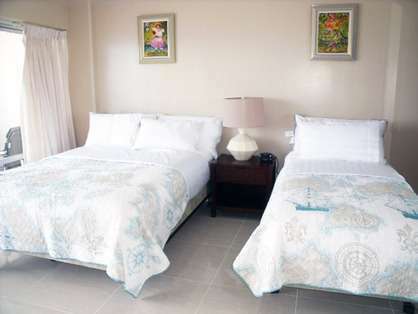 The condo also has a split-system air conditioner and free high-speed Internet, cable TV, and local phone service. This unit has an all new queen size bed, twin bed, and double size futon sleeper sofa AND has a privacy wall that separates the bed area from the living area. 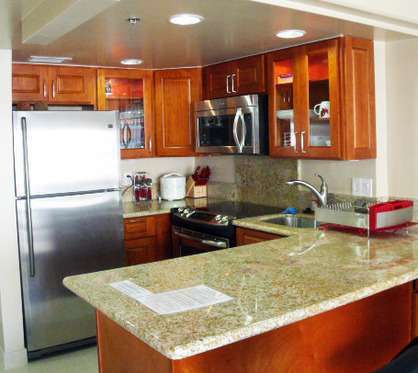 Don't be fooled by non remodeled units that haven't been updated in 20 years...everything in this unit is brand new from the studs out and attention to detail will insure you will have a great Hawaiian vacation. And best of all, location, location, location. This unit has the best direct ocean views available. While relaxing in your spacious condo or sitting on your shaded lanai, gaze out the stunning blue ocean and watch the sail boats or beautiful Hawaiian sunsets. 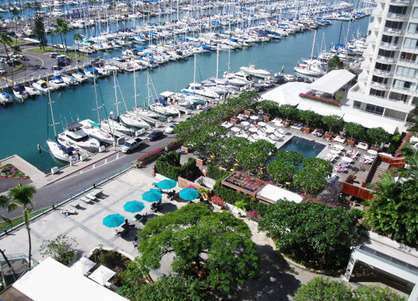 The Ilikai Condominium Hotel: The Ilikai is a landmark condominium hotel on Waikiki beach. In fact, it marks the beginning of Waikiki. The Ilikai was made famous by the opening sequence of the long-running TV series "Hawaii Five-0". It has been described by the guidebook "Oahu Revealed" as "A Real Gem", because of its Hawaiian ambiance and value for its location. The open-air lobby and relaxing courtyard of the Ilikai lead to a pathway to the beach. An Extraordinary Location: The Ilikai serves as a convenient base for vacationing singles, friends, couples, families and business people. You can't beat the location. 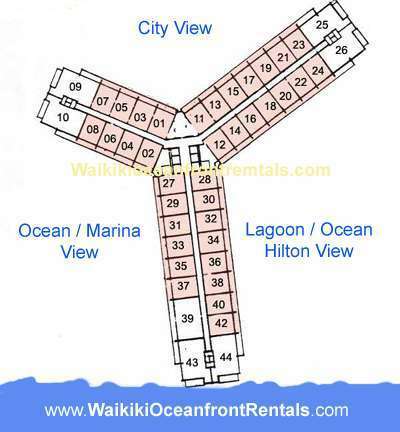 It is just steps to the Duke Kahanamoku lagoon and the white sands of Waikiki beach; it is one of the only ocean front properties on the ocean side of the main road in Waikiki. 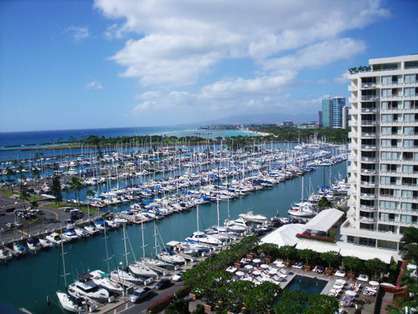 The Ilikai is located between the 5 star Hilton Hawaiian Village and the wonderful Ala Moana Beach Park. There are dozens of restaurants, shops and attractions within easy walking distance, including the Hilton Village, the Ala Moana shopping center and Lewars Street, Waikiki. Ilikai 1231 - Spacious, comfortable, clean, new appliances, perfect for a family of 5, conveniently located next to the lagoon, restaurants, shops, and more, plenty of street parking available, bar/pub is walking distance, pool was being renovated at the time we rented it but the lagoon is nearby, view of the marina and ocean, no view of the fireworks, easy rental, will definitely come back! Ilikai 1231 - Beautiful and nice place to stay, hotel are close to everywhere. Spent a great vacation with my family in Oahu and this room made us so relax. There are so many nicely prepared goods and furnitures such like comfortable beds , a wide variety of goods in the kitchen, etc. Would recommend this room to anybody who may stay at Ilikai area. We are sure to come back again. Thank you. 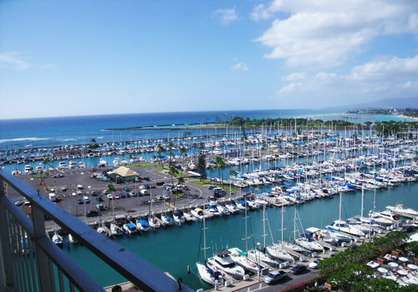 A very nice, comfortable condo with a spectacular view of the marina, eastern Honolulu near the shore, and the ocean. Especially lovely at sunset and sunrise. 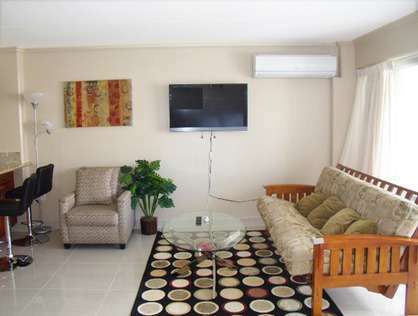 We highly recommend this condo and will certainly want to stay there again on our next trip! Many thanks for a most comfortable stay in Condo 1231 at the Ilikai. We had a wonderful holiday and the newly renovated apartment was lovely, with all that we needed and more. We really enjoyed having our meals on the lanai, with beautiful views of the harbour and ocean, and the sunsets were just amazing!!! Great location! Only a five minute walk to the beach and a ten minute walk to the Ala Moana Shopping Centre. Your great customer service was much appreciated and I will not hesitate to recommend you to my friends and family, as well as Condo 1231. Look forward to our next visit.